"The name and character 'Superman' is a Registered Trade Mark filed in the U.S. Patent Office under an Act of Congress of March 19th, 1920." 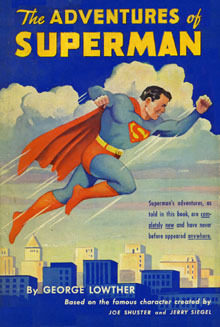 Continuity Note: The Superman presented in this novel is based on the 1940's version. Two notable firsts: Jor-L's name is here presented as "Jor-el." 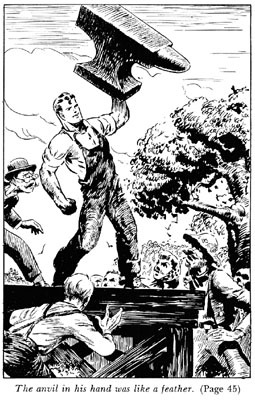 In the comic books, this would later transform into "Jor-El." Also, Superman's foster parents were named for the first time - as Eben and Sarah Kent. spitting hot rivets and laying his rails just ahead of the speeding trains. And now - Superman - wrestling with the mechanized might of today's world of airplanes and submarines and super-villainy. Superman! Most of you who will read this book already know him. Perhaps you have followed his adventures in the comics where first he was introduced to an astonished world. You may have heard his challenging voice on the airwaves of the radio or watched his flaming red cape as he streaked across the screen at the movies. His fame has spread to the four corners of the earth. In South America, in China, in South Africa his broad shoulders and flying cape are a familiar symbol. His exploits are told in many tongues. Millions of boys and girls in America have acclaimed Superman, strong and invincible, nemesis of evil-doers. Many who have followed his adventures with breathless interest have wondered about him: Where did he come from? Whence came his super-strength and marvelous powers? They have asked to be told again the story of his origin - of his arrival on earth from a distant planet, of his boyhood and youth, of his first discovery of his super-powers, and of his dedication to the fight against the forces of evil. So here is his story, from the beginning. The great hall of Krypton's magnificent Temple of Wisdom was a blaze of light. Countless chandeliers of purest crystal reflected the myriad lights into a dome of glass where they were shattered into a million fragments and fell dazzling over the Great Hall. Below the brilliant dome the Council of One Hundred waited. Attired in togas of scarlet and blue, they looked impatiently for the arrival of Jor-el, Krypton's celebrated scientist. They had been summoned from the length and breadth of the planet to hear a message Jor-el would deliver. What the message was they did not know. They knew only that when Jor-el spoke all men listened. Now they waited, curious as to the nature of Jor-el's message. Rarely did the brilliant young scientist leave the mysterious regions of his laboratory. Whatever he had to say tonight they knew would be of great importance to Krypton and its people. There was a sudden movement and a murmuring wave of voices rose and fell, echoing in the Great Hall. Jor-el had arrived at last. All eyes centered on the tall, thin figure that moved forward on the raised platform and took the hand of white-bearded Ro-zan, supreme leader of the Council. There were those who noticed at once that the handsome face of Jor-el was drawn and haggard. Something, they knew, was wrong. The Council of One Hundred waited in hushed suspense. Wearily, the young scientist turned to the gathering. Standing in the yellow and purple robes of his calling, he drew a deep breath. There was a moment's pause and then his voice filled the vast Hall.